On our mission to locate the smallest and best tankless water heater, we have discovered the most powerful and easiest units to install as well as from small holding tanks to point-of-use water heaters. You can read about our results below from our list of the smallest tankless water heaters currently available on the market and reasonably priced models. Our research team of experts has done the homework for you with updated manufacturing information, combined consumer reviews, product specification and features of each model. For consumers who live off the grid and want an efficient device that utilizes battery power instead of electricity to produce hot water or like the convenience of having instant hot water in an RV, boat or distant tap can find what they’re looking for on our list of the best small tankless water heaters. Just read our review to find the right water heater that fits your budget and home application. This small, compact electric unit is anything but nonproductive, it’s amazing what the RTEX 13 can do. Don’t let the price or small size (4 x 9 x 13 inches) impact your decision because you will be sadly mistaken, this device can get the job done. 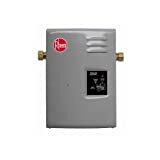 Rheem’s RTEX 13 is great for a tiny home, small studio or office, ice shack or a single occupant with low water needs. This unit is primarily designed for a single shower use; however, it’s far more adaptable. Previous customer reviews revealed that its applications were multifunctional and practical. The RTEX 13 uses 13kW at its maximum temperature and pulls 240 volts. You can anticipate a maximum of 4.0 GMP flow rate, but don’t expect to have hot water in multiple places, unless you alter your hot water use. The RTEX 13 is more expensive than other comparable small tankless water heaters, but its performance holds weight. With a maximum 4.0 GPM flow rate, you can use it for commercial as well as whole-home tankless water heater applications. 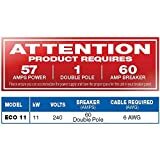 Besides the price of the unit, don’t forget that licensed electrical and plumbing services will be required to install the RTEX 13, and you will need a 60-amp service, but it does come with a two-foot, pre-wired power supply cord your convenience. The AT-900-03 is Atmore’s lowest end line of small electric tankless water heaters, but don’t let that influence your thoughts on its quality. This unit runs on just 100 volts and 3 kW. It will heat hot water for smaller applications like a crop or animal barn, workshop sinks, small retail shops, and it’s great for mobile applications. Equally matched to its small size is its very low price. This unit has a 45-degree rise in temperature, just like common devices with an inlet water temperature of 65-degrees for warmer climate zones and delivers about 0.5 GPM. Comparably speaking, it’s a really decent flow rate for a faucet that even works in colder climate zones. You will need an open 30-amp breaker in your service panel in order to install the AT-900-03. This is a device that is designed for a hard-wired dedicated circuit breaker. 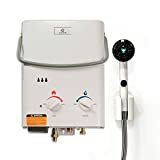 This small tankless water heater utilizes 1/2 inch NPT water connectors for a secure connection and weighs only 3.4 lbs. You don’t need much space to install this lifesaver in a small package. Let’s get acquainted with a product that is often times overlooked; however, once you feast your eyes on it, you’ll have all you can do not to buy one for your hand-washing sink or kitchen. This device can be best described as a small faucet that arches into your sink. 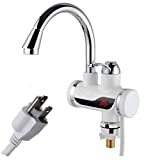 The AB Crew electric faucet will solve issues with bathrooms beyond the reach of the water heater and deliver hot water at the tap, even in cold weather environments. The device features a digital LED display that clearly shows you the water temperature and reads in Celsius. The unit uses 110 volts of electricity and comes corded and ready to plug into your wall receptacle. Most of the miscellaneous items needed to install this unit can be purchased at any hardware or home improvement store. This is a DIY project that most homeowners can handle without hiring a licensed technician. The faucet itself is made from plastic, and the device requires some time to heat the water. The fastest way to heat the water is to open the faucet to a slow flow of water to activate the heater, then slowly adjust it to get your required water temperature. The benefit is getting hot water at a rock-bottom cost; however, don’t set your expectations too high for information or customer support from AB Crew. This is a great point-of-view heater for those who would like to try one. The GL4S is one of easiest hot water heaters to install on the market. Just plug it into an outlet, preferably under the sink, and there’s no hard-wiring required. Attach this mini device to the cold water supply, plug it into an outlet, and it’s ready to produce hot water. It conveniently holds 4-gallons of hot water at the tap where you need it the most. It’s crazy, how simple it is to get this unit to start working, anyone can install this device. The most recent model has upgraded to a sensing probe that can adjust the temperature faster and maintain accurate hot water temperature. This Italian made product by Ariston is backed with a six-year limited warranty on the heat exchanger and one-year limited warranty on parts. Due to the compact size and power of this unit, it falls right in line with our mid to high priced small tankless water heaters. To install the GL4S, you will need about a 14 x 14 open space. If you’re in a situation where the bathroom faucet is located far away from the water heater, this could be the perfect solution. Some other applications for this unit include showers with multiple sprayers, hot tubs and of course, your kitchen sink. The Stiebel Eltron Mini 3 is a small electric tankless water heater that is manufactured in Germany and falls in the medium price range. The engineers at Stiebel Etron have made an aesthetically appealing device, the Mini 3 can be installed in plain sight without looking out of place. The Mini 3 comes with a standard 0.5 GPM compensating pressure flow reducer that has to be installed. It delivers warm or hot water at the point-of-use, and it works well for utility or hand-washing sinks in retail and home applications. If you have a remote camp, RV, boat or laundry area, the Mini 3 could be a wise choice. This application works well in office environments where business owners want to reduce their hot water consumption and utility bill. Just install the Mini 3 wherever you have an outlet and cold water supply for instant hot water. The voltage range of the Mini 3 is 110 to 120 volts and draws 25 amps of electrical power, and you can anticipate about 3.0 kW of power consumption. Their seven-year limited warranty against leakage and three-year limited warranty on parts is exceptional in this industry; however, read the fine print for the little details. The Mini 3 will produce about 0.5GPM at a 40-degree rise in temperature and 2.0 GPM when the temperature drops to 10-degrees. This unit works well for those who have low hot water demands and want the convenience of a small electric tankless water heater. The ECO 11 is the perfect solution for small apartments and spaces. It can be utilized for single and multiple applications. Depending on your environment, it can produce 1.3 GPM of hot water for two faucets in cold weather environments and 2.7 GPM for two faucets and one shower in warmer climates. The EcoSmart ECO 11 draws 57 amps, pulls in 11-13 kW and requires a 60 double-pole breaker for installation. EcoSmart’s small size offers an efficient way to heat hot water with a 240-volt electrical service. It’s important to check your current electrical space in order to install the ECO 11. This unit can reduce hot water consumption up to 50 percent and deliver your hot water demand very efficiently. Additionally, it uses a small amount of space for installation at just about a square foot, it’s the perfect solution for extra space, especially when you can remove an existing hot water tank for other things that you could use the space for. EcoSmart also offers a generous warranty on their electric tankless water heaters. If this is your first tankless water heater purchase, a trustworthy manufacturer with a quality customer service department may be important to you. EcoSmart’s technical support is second to none, they can help you with sizing or maintenance and installation questions. They also provide one of the best limited warranties in the industry for the heating element, exchanger, and electronics. If you’re on the hunt for the smallest and best electric tankless water heater, the Rheem RTE 9 should be considered. This is a compact and point-of-use device designed for remote locations, distant bathrooms, boats, RVs, and mobile applications. 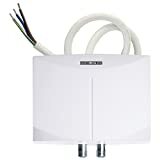 The RTE 9 is one of the more expensive units on our list of tankless water heaters; however, you get what you pay for. It packs a 3.0 GPM flow rate and chances are, if you’ve already done some research on 3.0 GPM devices, this shouldn’t be a surprise. It comes with a LED display that indicates the standby mode and active element and includes a two-foot pre-wired power cord. This unit at its maximum temperature uses about 9kW and pulls approximately 240 volts. The RTE 9 requires a 40-amp breaker for installation and is manufactured with a copper/brass heat exchanger. Additionally, it features modulating heat technology that produces hot water quite efficiently and super-fast. The unit will require 1/2 inch pipe fittings for plumbing connections as well. Eccotemp’s L5 portable propane tankless water heater is the ultimate solution for a hot shower in remote locations. It comes with the shower head, hose, and sprayer. This complete shower unit is very affordable and reasonably priced. The maximum flow rate is 1.5 GPM and can be utilized as a portable or recreational unit. Other uses can include applications like mobile animal grooming and hand washing stations. The unit ignites with two D-cell batteries; therefore, eliminating the need for electricity. This can play a big factor in your decision if you live off the grid or have a remote cabin. Because this is a propane fired outdoor shower device, it has very specific venting requirements: 18 inches from the ground, three-feet from a window well, one foot from anything flammable from side to side, and two-inch clearance from a wall. The L5 will generate about 37,500 BTU to heat the water, which is a very nice temperature for a shower. It comes with a CSA regulator that is designed to work with a standard 20lb propane tank. Consumer reviews have revealed that the unit has an automatic 20-minute safety shutoff valve, which means if your shower takes longer than 20 minutes, you’ll have to turn it back on. The L5 is also designed to work with a standard garden hose, and the adapter is included with the unit. We hope that we have successfully answered most of your questions about small tankless water heaters, and this comprehensive review makes your decision process easier. There are a lot of questions asked by people like yourself about these devices, and we’re happy to be able to assist you with reliable answers. Although large canister type water heaters are a more effective means of obtaining hot water in residential and commercial applications, the costs for running one of these units can impact your wallet. One way to cut your utilities in half is to upgrade your current system to a tankless water heater. The purchase price of the above models is very reasonable considering their energy-saving attributes, especially when you consider the potential for long-term savings. Our guide should have provided enough concrete evidence to make a decision today, and give you all of the information you need to make a solid investment as well as knowing if you need a battery-powered tank, plug-in unit or inline device. When it comes to choosing the smallest and best tankless water heater, balance your budget with your needs and feel confident with our recommendations.